[S1461] Jacquelyn Ladd Ricker, The Ricker Compilation, Norwalk VR, Eliza Brooks b. [S1461] Ricker Compilation, Norwalk VR, Eliza Brooks/Bradley Downs m.
Findagrave.com, memorial #47357635. Photo by Erik Andersen. [S1461] Jacquelyn Ladd Ricker, The Ricker Compilation, Norwalk VR, Charles Brooks b. [S1461] Ricker Compilation, Redding VR, Charles Brooks/Lucy Middlebrook m.
[S148] FindAGrave.com, memorials #47357635, #47357621. Findagrave.com, memorial #24525482. Photo by Dana Laird. [S1461] Jacquelyn Ladd Ricker, The Ricker Compilation, Norwalk VR, Henry Brooks b.; d.
[S1461] Jacquelyn Ladd Ricker, The Ricker Compilation, Stratford VR, Alice Wheeler b. 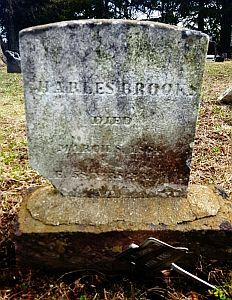 [S1461] Ricker Compilation, Stratford VR, Major A. Brooks/Alice Wheeler m.
[S148] FindAGrave.com, memorials #169184322, #169184323. [S1461] Ricker Compilation, Stratford VR, Wheeler Asa Brooks b.; d.
[S1461] Ricker Compilation, Stratford VR, Gilbert B. Brooks b. [S1461] Ricker Compilation, Stratford VR, Charles Edwin Brooks b. [S562] Barbour Collection, Stratford, Selena Ann Brooks b. [S1461] Ricker Compilation, Stratford VR, Mary Rexford Brooks b. [S1850] 1850 U.S. Census, Stratford, Fairfield, CT, M432_37/317A/636, Major A. Brooks. Probably the same man — note the request, "Bridgeport (Conn.) newspapers please copy." New York Herald, 22 Jun 1861. [S1461] Jacquelyn Ladd Ricker, The Ricker Compilation, Stratford VR, Charles Edwin Brooks b. [S59] New York Herald, 22 Jun 1861, Capt. Charles E. Brooks/Martha E. Hubbell m.
Findagrave.com, memorial #49859326. Photo by Bob Collins. Ann J. Brooks | 21 | F | Wife | MA | Marr | Res. 6y. Charles E. " | 1 | M | Son | Kings | Res. 1y. Ann J. Lundt | 40 | F | Mo Law | PA | Marr | Res. 6y. [S1461] Jacquelyn Ladd Ricker, The Ricker Compilation, Stratford VR, Gilbert B. Brooks b. [S1850] 1850 U.S. Census, Bridgeport Ward 1, Fairfield, CT, M432_37/225A/449, Phila F. Barnum. [S1860] 1860 U.S. Census, Ward 11 District 2, Brooklyn, Kings, NY, M653_770/485; FHL film #803770, Phoebe [sic] Brooks. [S2141] FamilySearch.org, "1855 New York State Census," ED 2, Ward 5, Brooklyn City, Kings, NY, line #15, family #676, image 39 of 72; FHL film #1930197, Gilbert B. Brooks. [S2348] FamilySearch.org, "1865 New York State Census," Ward 11, Brooklyn, Kings, NY; citing source p. 5, line 7, household ID 36; FHL film #1930207, Gilbert B. Brooks. 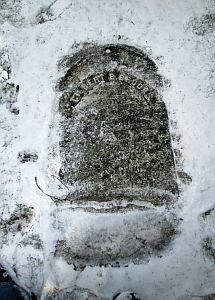 [S2351] FamilySearch.org, "NYC Municipal Deaths, 1795-1949," citing New York Municipal Archives, New York; FHL film #1323675, Gilbert B. Brooks. 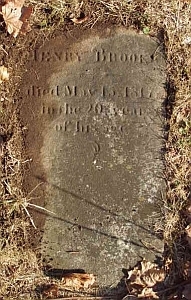 [S148] FindAGrave.com, memorials #49859326, #49859171. [S2350] FamilySearch.org, "Kings County Estate Files, 1866-1923," Kings County > Br > Brooks, Gilbert B (1869) > 10 images; Surrogate Court, Brooklyn. [S2231] FamilySearch.org, "Illinois, Cook County Deaths, 1878-1994" (FamilySearch), citing only "FHL microfilm," Frank Brooks. [S2347] FamilySearch.org, "New York, New York City Births, 1846-1909," Emma E. Brooks b. [S2276] FamilySearch.org, "New York, Births and Christenings, 1640-1962," citing Birth Certificates, Brooklyn, Kings, NY; FHL film #1380499, Emma E. Brooks. [S1461] Jacquelyn Ladd Ricker, The Ricker Compilation, Stratford VR, Mary Rexford Brooks b. [S1461] Jacquelyn Ladd Ricker, The Ricker Compilation, Stratford VR, Wheeler Asa Brooks b.; d.